Let's be honest: there are times when you're just not feeling it. Don't worry: we're all tempted to fake it sometimes. There are many reasons why you might want to pass off purchased baked goods as your own. Maybe you want people to think you're a better baker than you really are. Maybe you're pressed for time or ingredients. Maybe--let's be honest-- you're just plain lazy. But don't despair. 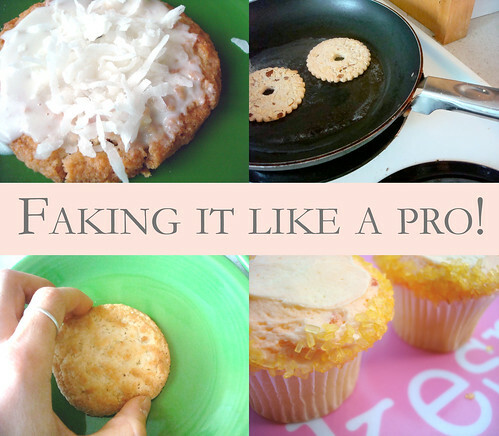 Whatever your reason may be, here are a few tips for faking it, dessert-style: by slightly editing store or bakery-bought baked goods to make them seem homemade. They're quick and easy, and bound to win you accolades--whether you deserve them or not, you lazy jerk. Cookies: One of the major challenges with store-bought cookies is that they are so--pardon the pun--cookie-cutter perfect. The solution? Put a pat of butter in a frying pan on medium heat. 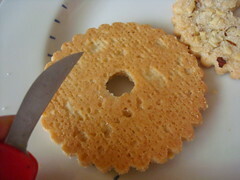 While it is heating up, take a lightly serrated knife (I used the mini one on the side of a waiter's corkscrew) and gently razor the edges of the cookie to create slight imperfections. 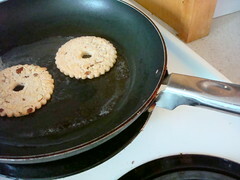 Once the butter is lightly bubbling, place cookies in the pan. Leave them in just long enough so that they begin to brown on the bottom. 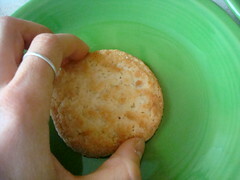 Remove from heat, and with your (very clean) hand, slightly dent the tops and sides to create a slightly "homemade" look. The genius of this method is actually twofold: not only do you get a more homemade look, but the frying also gives them a buttery, freshly-baked aroma. 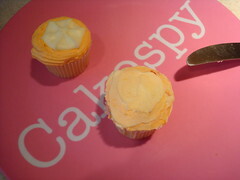 CakeSpy Note: Depending on the type of cookie, adding frosting on top is also a great added touch. 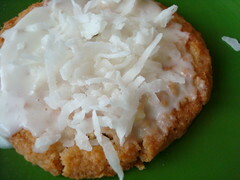 Top with shredded coconut, sprinkles, or whatever you'd like for added authenticity. 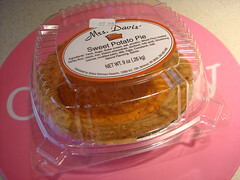 Pie: The problem with a store-bought pie can often be its too-perfect crust and perfectly even filling. What to do? First, you'll want to preheat the oven (I used 300 degrees). 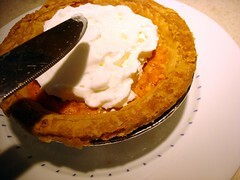 Once warm, place the pie in the oven for a short period of time--just about five minutes--until the crust has gotten a little bit soft. 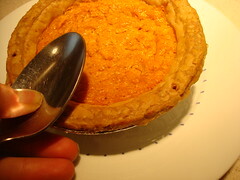 Once out of the oven, use the bottom side of a spoon to gently press down on the crust to create slight imperfections. As for that perfect topping? Cover it up! 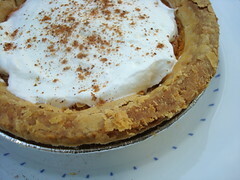 A generous topping of whipped cream, spread in a very homey, imperfect manner and then topped with cinnamon or nutmeg, gives a nice homemade touch. Cupcakes: The problem with cupcakes that you buy at the supermarket or at a bakery is that they are decorated just a little too beautifully. Though it might hurt you to do it, you're going to have to take them under the knife. Make sure the frosting is soft and doesn't have any crisp edges first, as they will cause weird little chunks in your reconstituted frosting. 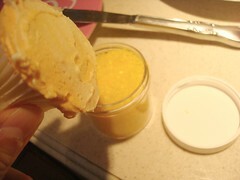 Using a butter knife, gently redistribute the frosting to look a little more homespun. 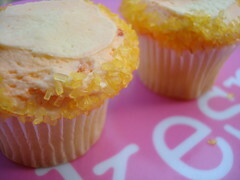 To look like you tried to do something fancy at home, try dipping the sides into sprinkles. Just like homemade...sort of. OK, so the ethics of these methods may be...questionable. But hey, it sure is fun to see if you can fool people. 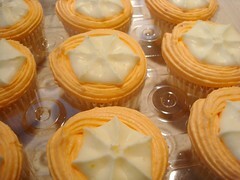 And nobody loses when you've got sweet treats! "It's my grandmother's secret recipe!" "I found it on a blog...but forgot to bookmark it!"